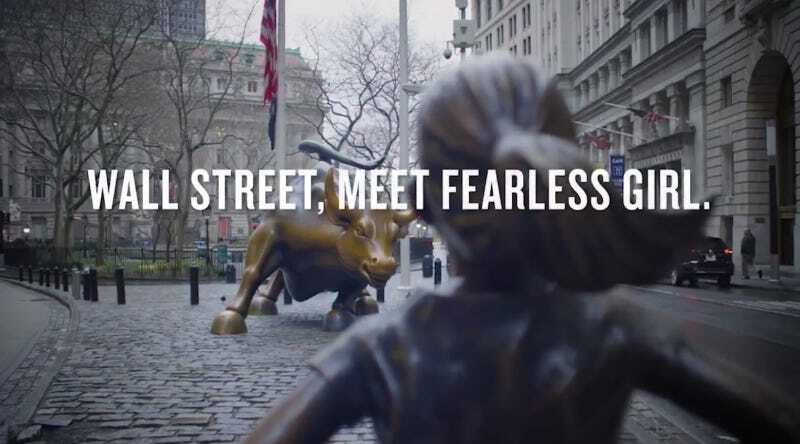 For International Women’s Day, ad agency McCann New York and investment firm State Street Global Advisors have placed a sculpture named The Fearless Girl across from the famous Wall Street Charging Bull statue in Lower Manhattan’s Bowling Green Park. The fearless girl stares down the Wall Street bull because she is fearless and believes that she is at least equal to a bull. McCann did get a permit for the girl statue. It will be up for at least a week, says the agency, which is negotiating with the city for it to become part of the art program so she can stay longer. Well, if there’s one thing girls love it’s extensions. At least if Fearless Girl doesn’t get hers, by then International Women’s Day will be long over and the world will have gone back to forgetting about the importance of women. Maybe they can trot her out next year when everyone suddenly remembers again for another day.